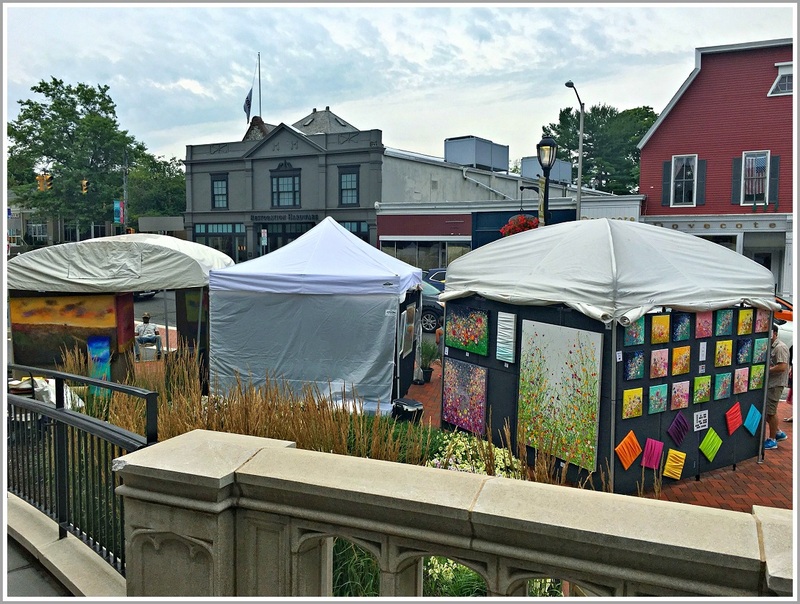 This entry was posted in Arts, Downtown, Entertainment, Library and tagged JP Vellotti, Westport Downtown Merchants Association, Westport Fine Arts Festival, Westport Library. Bookmark the permalink. Not funny in the least, Nancy. Wasn’t meant to be, Dan. What was it meant to be, then? It’s clearly not a migrant camp. You asked to catch first thoughts of irony in the top photo. Maybe commenters need to fill out a membership form, then. Sorry if my comments mess with your commentary. Carry on. Maybe you need to be banned. Get lost. You add no value. The missing store front lettering in the center of the photo for Max’s. Westport misses Fine Arts Theater! I thought maybe it was the paintings of flowers on one of the stalls is actually facing flowers that are next to the railing. I had not thought of “Fine Arts” Cinema gone. I was thinking only of the fact that Max’s Art Supplies is the “missing” storefront in the center of the photo. But the Fine Arts theater adds a double bit of irony. Now I’m wondering if JP was referencing both, or only one! I iinitially was thinking only of Max’s…the pic happened a few moments after I heard an artist explaining how he painted. His comment was something like, “It’s not like I go out and buy a tube of paint every week.” So I of course thought of Max’s and my one summer of trying to learn to paint and buying tubes of paint there. The initial irony was that Max’s is closed and yet there is all this art across the street. At the same time the only blank canvas in the area if you will is the craft paper on Max’s windows. But when I walked up the YMCA steps…I mean Anthropologie…I saw not just the old theater…er, Restoration Hardware…but a new landscape and realized it wasn’t the tubes of paint inside that made people love Max’s. I’ve easily been to twenty Westport Art Shows but this year was by far the best. The return to Main Street. The multiple bands (Led Zepplin’s Babe I’m goin’ to leave you on saxophone was mind-blowing). The expansion of the festival to Elm Street and Church Lane plus food vendors and the well-times book sale!! Add a swing band at the Levitt tonight and I think Westport is as artsy…call it Bohemian if you want…as it gets!! Thx. Clearly the meaning of irony…like art…is different for everyone!! Wow! Thank you JP for your positive feedback. We (the WDMA) work incredibly hard to produce this event, and your comments are greatly appreciated. One of our top priorities is to give our community a wonderful, family-friendly weekend filled with arts and culture. 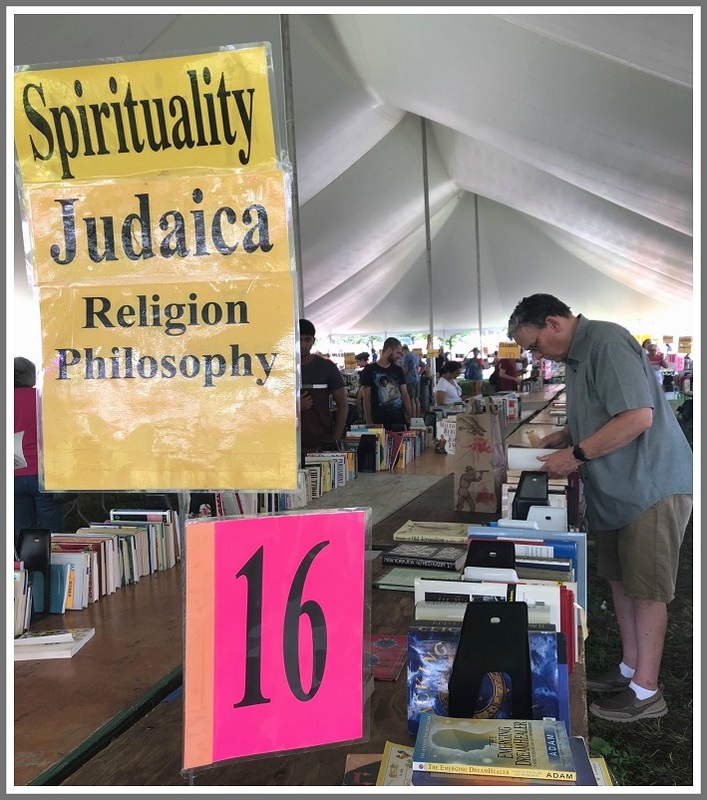 The Library Book Sale happening adjacent to our festival and our on-going partnership with their team works beautifully. The combination of the two events creates a weekend that truly has something for everyone! We are thrilled to hear that you enjoyed your experience. After a long, hot weekend, and some very tired bodies, reading your comments was so gratifying. Thank you again! Fine Arts & Max’s Art Supplies. Sad. Funny, but I kept looking at the wrought iron railing in the foreground walkway, and thinking … nah, way to literal! (Heh, kidding here). But yep, that streetscape isn’t what it used to be: Max’s, Fine Art’s Theatres (where I witnessed the first Star Wars in the 70’s, and was forever a changed human being since), my old job at Quick Copy, the hair salon that harkened to the 1950’s/60’s, The Ships, The Smoke Shop, and of course the early incarnation of the Toquet Hall upstairs. Wax’in poetic … we townies sure know how to stir up the sentiment of days past. Now thinking about Max’s, where my dad probably bought his watercolors and paper. What was is now only a pop-up! Congratulations to you Coleen and to the Westport Downtown Merchants Association for providing a wonderful art show. Not only was the juried quality great but the diversity of media was outstanding. It was genius to pair it with the Library book sale. Your attention to detail was very evident. Thank you so much for all your careful planning hard work. Our events director Jacqui Bidgood and artist director Sue Brown Gordon both did an unbelievable job on artistic representation, logistics and the execution of the event. We are very lucky to have such a dedicated and talented team! We are all very committed to preserving Westport’s creative spirit. Thank you Marion for noticing all the work that is required to make this event successful! As a participating artist, I’d like to add my thanks to Randy, Colleen, Jacqui, Sue and the whole team for a beautifully run event. Indeed, they did think of everything, and many of the merchants were also welcoming and generous with their AC and cold water. And let’s not forget to thank this community for their support of the event and the artists. It is truly a privilege to live in a place that values its artistic community. With the recent involvement of the Artists Collective of Westport at the activities center, it was also heartening to see so many kids enjoying creating their own art, and then walking the festival with their families, already art lovers! Well done- Save me a booth for next year! Amy, we are lucky to have your participation in our event both as and artist, and as a member of the Artist Collective, who, by the way, hit it out of the ballpark in our Kids Zone! Most importantly, thank you for pointing out something I did not mention in my post-show haze, which is without the incredibly talented artists and the community support this show could not thrive. We are aware of the effort it takes artists to prepare for and attend our show, some traveling quite a distance to be here, and we are grateful to have such outstanding work represented at our event. I’d love to see a bunch more pictures of the event so I can feel like I was there! Unfortunately, I was away this weekend — I got there at the tail end. I did not get any good photos. Sorry!